Summer: aka the time of year when the need to get out of the house and find something fun to do ratchets up a notch or two on the priority list. Memorial Day being the unofficial first day of the season, we thought we’d help you out by opening our doors free of charge. That’s right: it’s time for another Target Free Holiday Monday. This weekend LACMA will launch Cell Phone Stories, a series of narratives and essays circulated exclusively via mobile phone technology. The project was conceptualized by artist Steve Fagin, who invited writers, designers, artists, and actors to refigure and rethink the museum and its audience. To give you better idea of the project, we asked Steve to explain it in his own words. I could blame this project on author Barry Yourgrau, who told me of the fortune cookie-size novellas he was writing for the Japanese cell phone market, but Barry is one of the collaborators on the project, aka, Team Phonie, so he has been given immunity. Or I could blame LACMA director Michael Govan, who suggested I come up with a project that would rescue his museum from the endless remarks that LACMA was a third-rate wannabe Met, but alas, poor Michael is already under indictment for a capital offense, the wanton destruction of the art form of the twentieth century, THE CINEMA. So, I will absolve poor Michael of responsibility for the misdemeanor of encouraging, abetting, and commissioning my Cell Phone Stories project. So lookin’ round the room, who is to blame? Should I, as Claude Rains would put it (know your cinema),”round up the usual suspects”? I think not! We should go after the master criminal and point our index finger of guilt at the Dr. Mabuse (Know Your Cinema) of our little story, and that is beyond a Shadow of a Doubt (KNOW YOUR CINEMA) Steve Jobs. J’accuse (kyc) l’iPhone! Honestly, your honor, I took just a small bite. BiP (before the iPhone) the use of cell phones to access the internet was ubiquitous in Japan and virtually nonexistent on the rest of the planet. This ubiquity in Japan was the breeding ground for a cacophony of cell phone-specific projects. Perhaps the best known was keitai shosetsu, the short story form written specifically for the cell phone and mostly marketed to an avaricious teenie bopper market. I learned of this phenomenon through my globetrotting friend, Barry Yourgrau. Barry had been writing his type of stories, definitely not teenie bopper, for the Japanese cell phone market and clued me as to this fever for the short-form downloaded story. Well, I must confess museum time makes getting something moving forward transform Kafka’s Austro-Hungarian empire into a speedy and agile “in an Intel minute” type of enterprise. From the initial conceptualization in January, 2007 to the present downloading of things to your cell phone, the project has moved from novelty to ubiquity. I must confess this is a great relief to me and a “nothing to lose but your chains” moment for our Cell Phone Stories project. No more are we are on the “cutting edge of technology, ushering in a new age for mankind,” creating the new art, encore, encore, encore, ad nauseum. There is nothing more tired and ragged than the concept of the new. Over and over and still over again from the dawn of the twentieth century to its doom we have been bombarded with the hackneyed idea of the new. I’ll take the everyday over the novel every day of the Soviet Gregorian calendar (of course, this invention of the new would have to keep being pushed back, past the French revolution, back and still back again, but we have no time to tell that story). 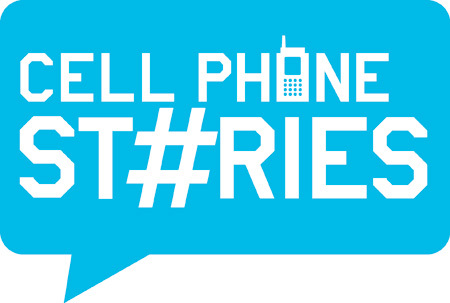 Five cell phone exclusive stories refiguring common forms (i.e. jpeg, Facebook, Twitter, email, voicemail, etc.) told over a season. How might one daydream a museum they have never attended? The Mulleavys create sketches inspired by works from LACMA’s collection. Steve Fagin’s alter ego–a ventriloquist dummy—tours through LACMA creating a story equal parts Flaubert and Facebook. Microanalysis of the museum and tweeting as an endurance activity. A series of short messages and reflections that consider the museum and its cast of characters from multiple vantage points. To participate in the project, text “LACMA” to 67553 and you will receive weekly text message links to each new installation of the project. You can also join us Saturday, May 29 at 1 pm for a performance by Rich Bott, who will use SMS and Twitter to unleash a story inspired by LACMA’s collection in the vein of mystery writer Charles Willeford. I had the chance to talk to Christopher O’Riley in advance of his performance at LACMA later this week. O’Riley is an accomplished classically trained pianist known for crossover arrangements of rock songs—particularly Radiohead. We talked about appropriation in music and the visual arts, song structure, and crossover audiences. 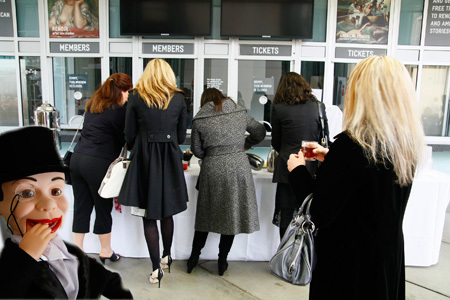 What will you be performing at LACMA? A few Radiohead songs. Also Tori Amos, Terry Riley, Raymond Scott, Thomas Adés, Nirvana, the Cure. Also some Ravel. You’re well known for your piano arrangements of Radiohead songs. What is it about Radiohead? Most of what draws me to any music is the combination of harmony and texture. Radiohead has an arresting harmonic language the way they choose chords that go into their music. I’ve always found it engaging. They also excel at the creation of a large-scale musical texture, which comes from the interweaving of different voices, different parts. A lot of pop music can be vertically oriented—crashing chords. Just about every Radiohead song is made up of an intermingling of voices. There is still verse and refrain in the overall structure, but there’s also a thread, a weave that leads you through the piece. In visual art, we talk a lot about appropriation—the way that a painter, for example, will borrow from the art of the past, or from popular culture. How do you think about appropriation in music? It’s been part of music for a very long time. When Beethoven wrote his symphonies we didn’t have radio or symphony orchestras in every town. Franz Liszt made arrangements of these symphonies for solo piano. A hundred years ago there were more pianos than radios in households. Arrangements for solo piano were an expedience that grew into a conceit—it became a matter of showing off the piano, a way of saying: here is this percussion instrument and I can make it sing like a symphony orchestra (or a five-piece rock band). I’ve been trained as a classical pianist and I grew up playing rock music. I’m comfortable with the membrane between genres. If there’s something I want to play, I find a way through the various sound languages I have at my disposal. Tell me about your audience. I’ve had a great time introducing people to music they may not have been familiar with but that I find extraordinarily beautiful—that explains the lesser-known pieces on the program, like the Thomas Adés piece, Darkness Visible, which is itself based on a four-hundred-year-old piece called In Darkness Let me Dwell, by John Dowland, an English composer. Darkness Visible is an explosion of that song. You hear the melody flung over eight octaves of the piano. It used to be a lot weirder when I would play a recital and the first half would be classical and the second half would be Radiohead. You’d have the more staid classical audience, and they would be looking at these young whippersnappers with their lighters in their hands ready to go. Duke Ellington’s adage that there are only two kinds of music, good music and the other kind, is a call to musicians on both sides of the fence, rock and classical. I’m responsible for performing what I believe in and I hope the audience will come to the experience without preconceptions or genre preferences that come from liking only that which has been pounded into your head by the mass media. It’s gratifying to me when kids who like my Radiohead songs see Mozart on my calendar and say “Oh, I always wanted to check him out.” It gives them a way in. When is a Tiger Not a Tiger and a River Not a River? The fact is there was no official title for this work prior to its acquisition. The two-panel screen was discovered in 2006 in an English country house. Rob estimates that it might have been in England for at least the last 100 years. When it was brought back to Japan, the NHK (think “the BBC of Japan”) documented its arrival and followed the scholar Tsuji Nobuo as he looked closely at the screen for the first time, to determine whether or not it was a genuine work by the great Sansetsu. Here’s a clip from the broadcast. Then again, one might ask: Is this a tiger? Is that a river? Too, what river has waves like that? Is this tiger sipping from the ocean? “I don’t think so,” said Rob. “What animals drink salt water?” Even if Sansetsu didn’t know the accurate details of the tiger’s paws, he would not have turned the image into total fantasy. So, it is a tiger, and it drinks from a river. Thus we return to that last nagging word, raging. Finally Rob decided that it was appropriate. 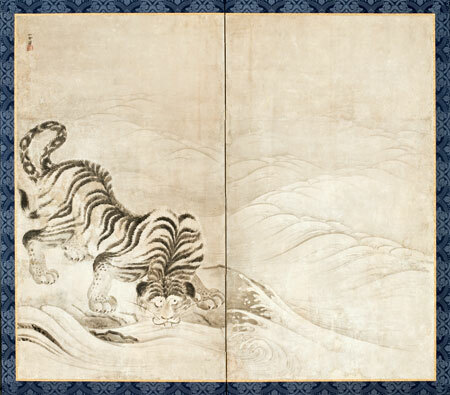 It’s an adversarial image—the river is squarely on one panel of the screen, the tiger on the other; the tiger is poised on a rocky edge as it nips at the water, and the waves are many—they stretch into the distance almost like a mountain range. Were you take a raft to that river, “raging waters” would probably describe your experience. In the foreground Homer depicts three women who have emerged from the shore. Two are depicted with their legs revealed, while the middle figure stands with her back to the viewer. 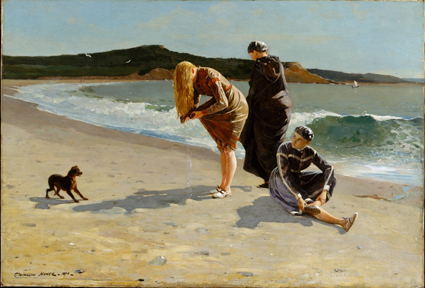 After the Civil War, Winslow Homer’s works that featured women tended to evoke a sentimental quality, and in a sense a throwback to traditional values (if you get a chance to see the show, see Homer’s Croquet Scene (1866) next to Eagle Head). Yet this work, while depicting three young ladies enjoying a day at the seashore, was reproduced quite differently. You can see the difference in the Brooklyn Museum of Art’s engraving of Homer’s High Tide (1870). Instead of revealing bare legs, the skirt of the young woman wringing out her dress now shows her garment gathered past her ankles. Also to the left of the canvas, where once a seemingly harmless dog stood with a somewhat inappropriate upward gaze, now lies the young woman’s bathing cap. Eagle Head, Rochester, Massachusetts is only one of the numerous paintings in American Stories that pose the question of the United States’ transformation to a modern audience. A year before this work was made in 1870, Elizabeth Cady Stanton and Susan B. Anthony formed the National Women Suffrage Association, which would eventually merge in the 1890s with the American Women Suffrage Association. While women would not gain their right to vote until fifty years later, in 1920, this painting and its censored reproduction thus reflected the ongoing issue of women’s rights. If you do get a chance this weekend to see American Stories, I hope you’ll take a moment to look at the works, and see the depictions and stories of the past events that ultimately developed our nation—stories that even for modern audiences still strike a resonant chord to this day. While I’m sad to see this exhibition go, I look forward to another exhibition the American Art department has been working on which will open this summer: Manly Pursuits: The Sporting Images of Thomas Eakins. LACMA’s Wallis Annenberg Photography Department has published four books in the last year that have one thing in common: in their own individual ways, they communicate our relationship to very specific moments from the first 150 years of photographic history. Only one of the four, coincidentally titled Four Over One, by Phil Chang, uses images to explicitly explore a world dealing with digitization and obsolescence in photographic processes. 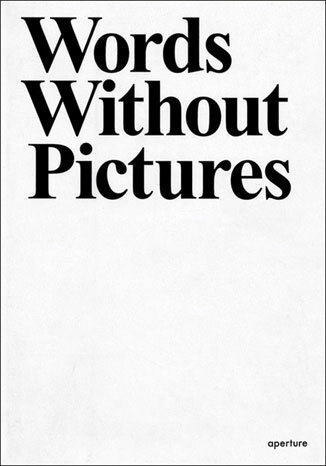 Another, Words Without Pictures, edited by Alex Klein, includes pointed essays discussing online images and digitization. The other two books, The Sun as Error, by Shannon Ebner, and Bananas for Moholy-Nagy, by Patterson Beckwith, are so not about digital photography—so steeped in analog filmic processes—that their obvious footing across the divide becomes part of the message. It’s hard not to wrestle with the topic of digital photography in today’s conversation about photography. I recently attended a two-day slap fight of ideas verging on verbal pugilism at times—the symposium “Is Photography Over?” hosted by SFMOMA in April. You could probably count the minutes on two hands (maybe three…) before the word “digital” pounced onto the scene and began to be regularly peppered throughout the days’ conversations as a path to an answer, only to be quickly abandoned for more interesting fodder. It’s not breaking news that digital has changed the way that we take, view, disseminate, think about, talk about, process, collect, commodify, archive, protect, believe, disassociate ourselves from, manipulate, research, and relate to photography. But has digital strangled photography to death, lassoed with the lariat of a binary zero? According to the thirteen panelists of “Is Photography Over”—artists, curators, academics, and authors—probably not. Or at least the players creating photographic art in the hereafter (or is it just art?) are looking quite spry. The books mentioned above will continue to explore what it is that’s “going on” with photography. 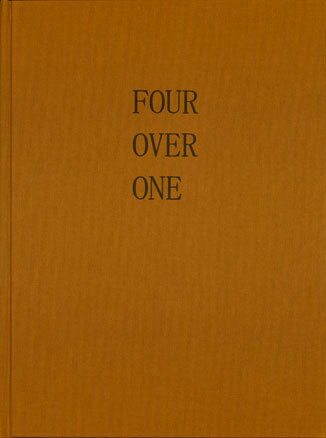 Phil Chang’s monograph Four Over One is page after page of gently shaded but monochromatic prints that shift like the weather from one image to the next. Finding an explanation for this seemingly subject matter-deficient presentation takes a bit of detective work. Other than a production note on the second-to-last page (“The photographs in this publication were made using an i2s Digibook 2000LC book scanner and Kodak Kobachrome II RC photographic paper”) and a list of specifications in place of a list of plates, there is one sentence buried within the acknowledgements that speaks to the theme: Four Over One is “… a project that centers on economy and obsolescence….” I guarantee this is one of the most unusual books you will ever come across. “A plain, matter-of-fact enumeration of the specific photographic elements—will be enough to enable us to divine the power latent in them, and prognosticate to what they lead.”—László Moholy-Nagy, from his essay “A New Instrument of Vision” (extract from “From Pigment to Light”, in Telebar Vol. 1/2, 1936) as printed in Bananas for Moholy-Nagy by Patterson Beckwith, with an essay by Alex Klein (Los Angeles: Los Angeles Museum of Art, 2010), p. 11. 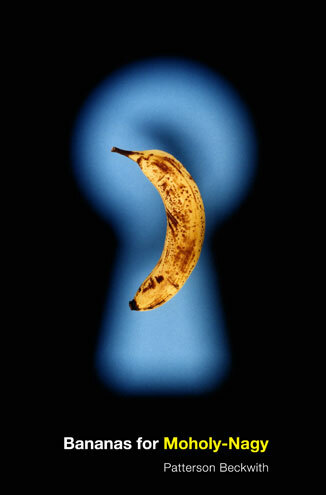 In the forthcoming Bananas for Moholy-Nagy, Patterson Beckwith quite literally, but with slight tongue-in-cheek, interprets “The eight varieties of photographic vision” as put forth by László Moholy-Nagy in “A New Instrument of Vision,” from 1936, by photographing bananas in eleven different ways—x-ray, filters, photograms, prolonged exposure, etc. “The only type of corruption of transmitted data that has been discussed is the error. An error actually represents two unknown quantities in general: location and symbol value,” referred to via asterisk on page 239: “Wiggert, Djimitri. CODES FOR ERROR CONTROL AND SYNCHRONIZATION. Massachusetts: Artech House, Inc., 1988.”—from The Sun as Error, by Shannon Ebner, coordinated by Dexter Sinister (Los Angeles: Los Angeles County Museum of Art, 2009), edition notice page text; p. 239. 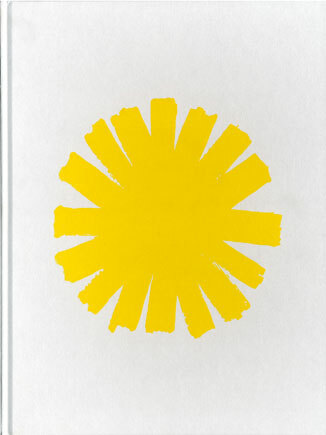 Shannon Ebner, in The Sun as Error, includes diagrams and illustrations from practical-photography textbooks and Ansel Adams’ The Print and The Camera interspersed with her own work, which spans tableau text-based setups and quixotic moments of close-up landscape and living-scape captured on film. Citations for the anachronistic elements similar to the caption above provide for some entertaining reading at the end. “One of the most important facets of the digital era is that it created both the markets and desires to revisit the past…”—Charlotte Cotton, in her essay “Process, Content, and Dissemination: Photography and Music,” from Words Without Pictures, conceived by Cotton and edited by Alex Klein, Aperture edition (New York: Aperture, 2010), p. 228. Words Without Pictures, in title alone, says it all. The book is a record of what went down when a series of online essays, discussion forums, and live-for-the-audience conversations created “spaces where thoughtful and urgent discourse around very current issues for photography could happen.” Words Without Pictures includes essays with titles like, “Photography as Art,” “Online Photographic Thinking,” “Remembering and Forgetting Conceptual Art,” “Abstracting Photography,” all born by c-section from the mother of all questions about photography. And this mother—this urgency—is the digital. If not the mother, then, at least, a very nosy neighbor. The Photography Department is celebrating the publication of these four books with a reception this Sunday at 4 pm at Art Catalogues at LACMA, including a conversation moderated by Britt Salvesen, curator, Wallis Annenberg Photography Department, with artists Patterson Beckwith and Phil Chang, and light refreshments. 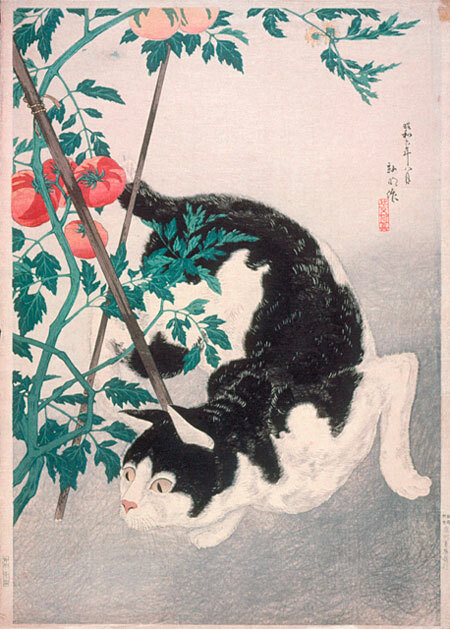 While the woodblock for Cat with Tomato Plant (pictured above) was being carved in Japan in 1931, and the world was being rocked by the Great Depression, a man in Logan, West Virginia, named M.C. Byles was perhaps just starting to mull over the following thought: “By golly, someone ought to build a better tomato!” Byles was an auto mechanic at a shop that was conveniently located at the bottom of a steep incline that apparently vanquished more than one over-taxed trucking radiator. Luckily, one could just put ’er in neutral and roll right back into the healing hands of “Radiator Charlie” Byles, as he was known. But radiator-fixing was not the only skill set acquired from Byles’ vast gamut of experience. Proudly claiming “I never been to school a day in my life,” Byles had been a cotton picker, a member of the National Guard, a pilot, a wrestler (or “wrassler” as it’s called in Appalachia), an auto mechanic, an inventor, and… an unconventional tomato breeder. Yes, Radiator Charlie decided to try something with tomatoes. He ingeniously positioned a tomato plant called the German Johnson in the middle of a circle of 10 other tomato plants—varieties chosen for their tendency to grow unusually large tomatoes. Using a tiny ear syringe, he then transferred pollen from the plants in the circle to the flowers of the German Johnson. After seven years of collecting and planting the seeds from the resulting tomatoes, Radiator Charlie finally had grown a plant of which he could be proud. This varietal eventually became known as Radiator Charlie’s “Mortgage Lifter” because, dagnabbit, Radiator Charlie paid off his $6,000 mortgage in the thick of the Depression by selling these tomato seedling plants for a dollar a pop! The giant spheroid Mortgage Lifters, clocking in at one to four pounds, fed entire families of eight. Learn more about Radiator Charlie by listening to an archived show of the radio program Living on Earth, which includes a recording of Radiator Charlie himself! As a part of EATLACMA, LACMA and artists’ collective Fallen Fruit are hosting a Tomato Hootenanny this Saturday, which will include tomato seedling adoptions. 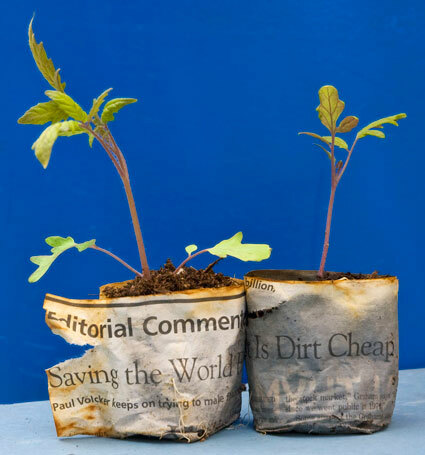 Artist Anne Hars has been growing Mortgage Lifters from seed in special pots made from the financial section of the newspaper to include in these adoptions. She and artist Stephanie Allespach will also be leading a tomato seedling workshop with several varietals of tomatoes (including the Mortgage Lifter). Download adoption forms here. You are currently browsing the Unframed The LACMA Blog blog archives for May, 2010.